The number of videos in people's Facebook feeds grew by 3.6 times over the past year, the company says, the result of a broad video push by the company that may be just getting started. Facebook has gradually been encouraging more news feed videos from marketers as part of an effort to siphon ad dollars away from Google-owned YouTube. The company started letting advertisers test video ads that play automatically in news feeds in late 2013. The company has also tweaked its news feed ranking to take into account how much time users spend watching videos. That means a popular video can move higher up in a user's news feed. 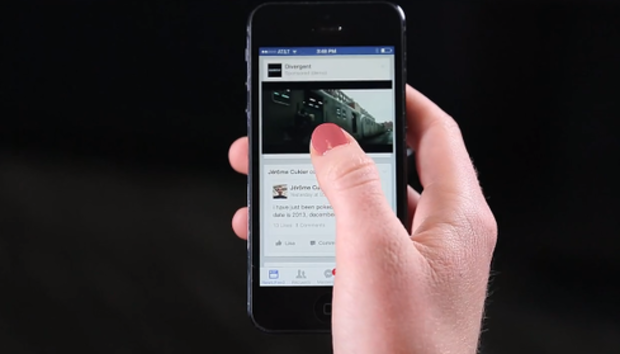 CEO Mark Zuckerberg sees video as becoming much more prominent in the years ahead. It's a new era for video on Facebook compared with 2008, when the site was simply hailing the ability to upload video in high definition. Now, in 2015, Facebook users are likely to see more videos from brands and from their friends, as the company tries to become the site where people discover videos. "We're increasingly seeing a shift towards visual content on Facebook, especially with video," the company said Wednesday in a blog post offering video growth stats and tips for how to get videos seen. The post was directed at both paying advertisers and Facebook users, including video professionals. Since June 2014, when Facebook tweaked its news feed algorithm for video, the site has averaged more than 1 billion video views per day, the company reported Wednesday. Facebook says it has more than 1.3 billion total users. The increased viewing activity is not just due to the algorithm change. People are posting more videos. Over the past year, the number of video posts per person has increased by 75 percent globally, Facebook said. For successful videos, Facebook recommends that brands include exclusive video and links to related content such as retail items. The company provides analytics tools for Page owners to see how their videos perform. The videos that do best are the ones that grab people from the start and are short and timely, Facebook said Wednesday. Want an example? Facebook points to this video of Taylor Swift singing in her car. It's short, and it certainly grabs you. Then again, it achieves a similar effect on YouTube.